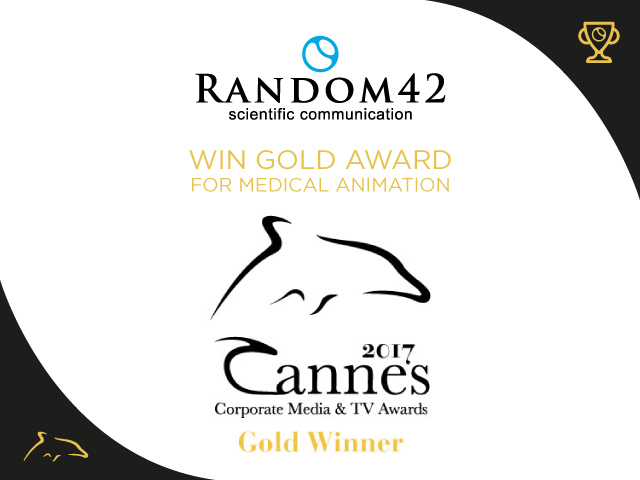 Random42 Scientific Communication have been awarded a Gold Dolphin at the 8th Cannes Corporate Media & TV Awards for their work in Medical Animation. The Cannes Corporate Awards annually honour the world’s finest corporate films, online media and TV productions, in one of the most important film centres, Cannes, France. The awards were founded in 2010 by Filmservice International. Since then the festival has constantly grown, becoming one of the top festivals for corporate films worldwide. The success of the festival is due to increased number of entries, prestigious participants, innovative and qualitative works, prominent jury members (Oscar and Emmy winners) and participating countries from all 5 continents. Random42 Scientific Communication have won over 150 industry awards in their 25 year history, to view a full list of accolades visit their Awards page. Random42 Scientific Communication is a leading scientific communication studio specialising in medical animation and education, scientific virtual reality, interactive and visually engaging solutions for global pharmaceutical and biotechnology companies. In their 25-year history they have produced core digital assets for over 550 product launches to date and won over 150 industry awards.